Restorative scenes: Most Star Island visitors stay at the historic Oceanic House, overlooking lawns and the harbor. 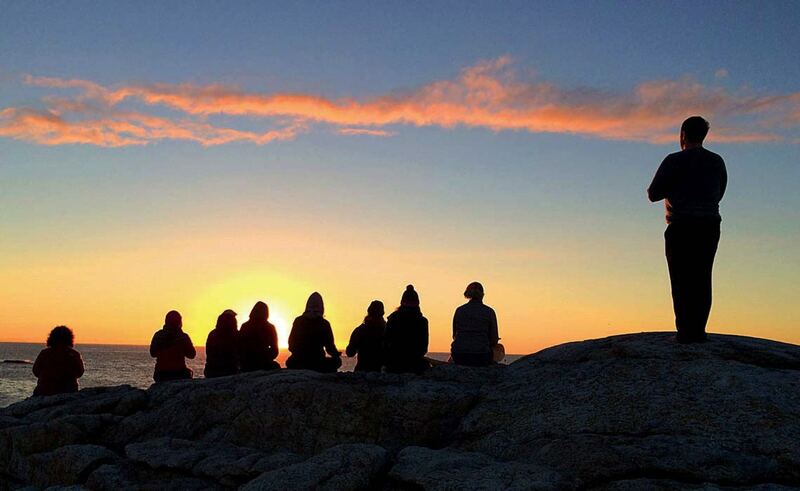 Yogis on retreat perch on rocks to watch the sunrise. 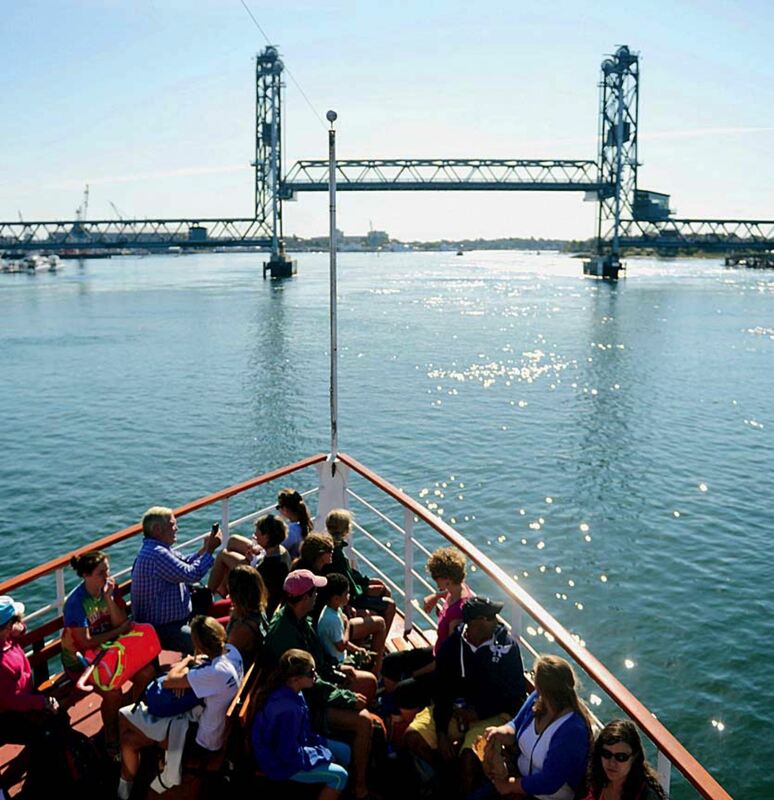 A ferry leaves Portsmouth for a trip to the Isles of Shoals. The day’s activities are written on school-room chalkboards. 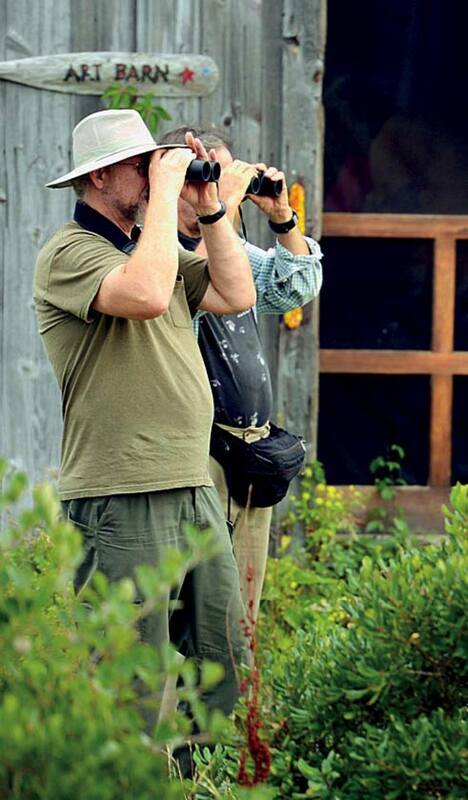 Birders, especially, enjoy island walks and boat tours of the Isles of Shoals. Children tend to run free, play games, and swim off the dock. 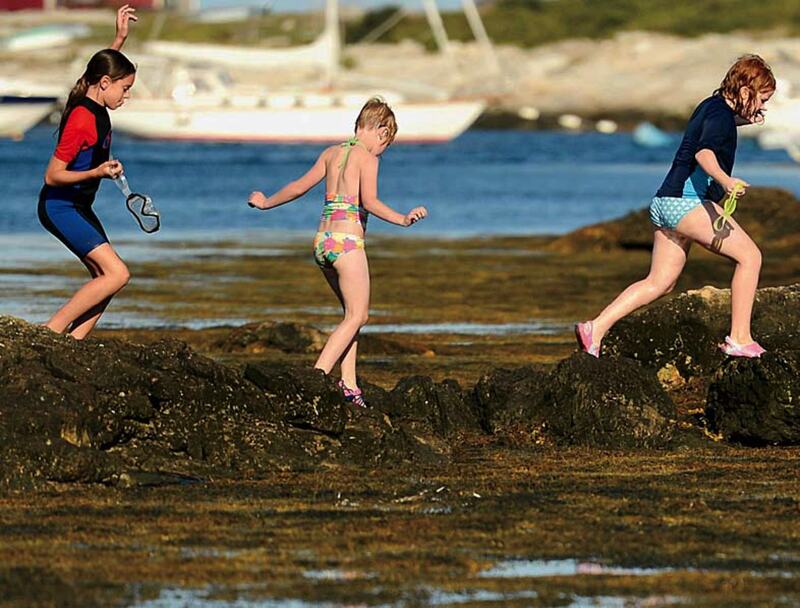 She’s been coming to “this sacred place,” one of the nine Isles of Shoals that sprout up about 10 miles off the coast of Portsmouth, New Hampshire, since she was a teenager, and is still awed by its wild beauty, intriguing history, and the community of people devoted to preserving both. The ferry ride to Star takes only 75 minutes, and on clear days the mainland is faintly visible from its southern coast. Yet when disembarking at Gosport Harbor (named for the original 1715 township), there’s a giddy sense of having tricked time. Stormy weather looms off the island’s western end. 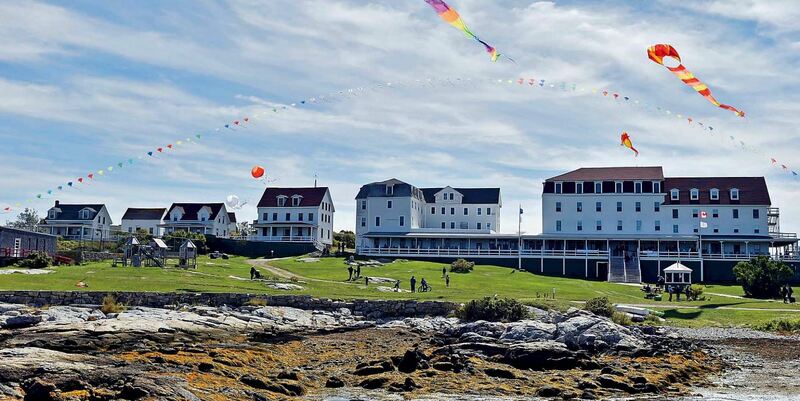 The grand Oceanic Hotel, constructed in 1876, looms large at the end of a grassy path uphill from the dock: a rare surviving Gilded Age resort—and the only one on New England’s coast to have escaped complete renovation. Its generous, wraparound porch holds rocking chairs where guests sit to read, write, and talk, watch the tides, or just enjoy ocean views and breezes; for birders, there are terns, barn swallows, and cormorants to follow. The lobby holds a grand piano and clusters of sofas and chairs, many times repaired, and tables set with board games and jigsaw puzzles. 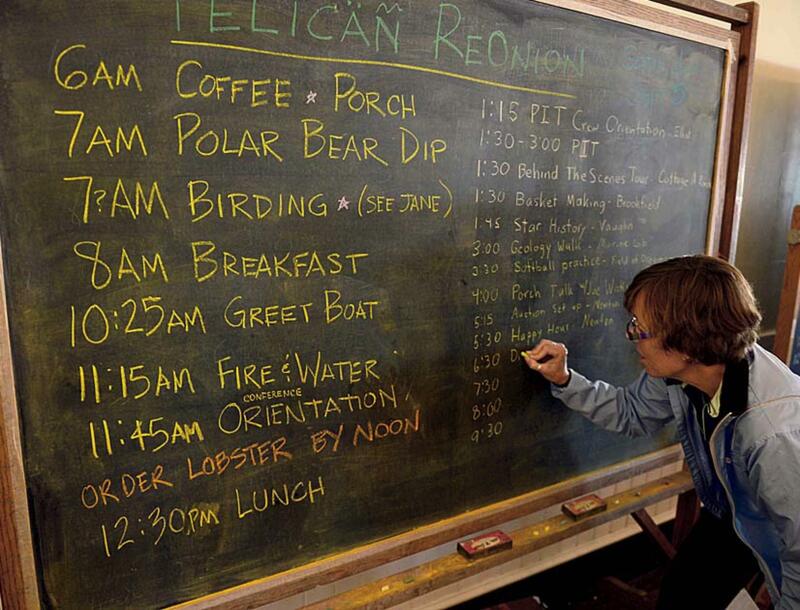 Chalkboards that have been there as long as anyone can remember list the day’s activities. 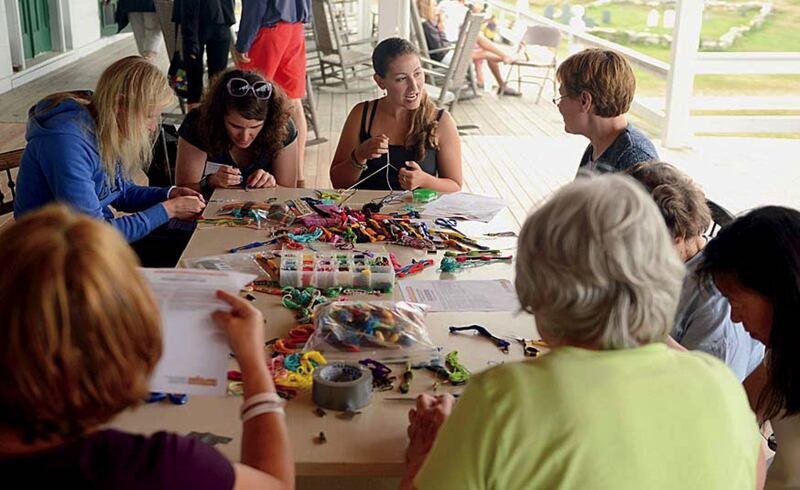 One day, along with yoga on the front lawn and chanting in the stone Gosport Chapel, built in 1800, there are sessions for contra dancers, choral singers, folk musicians, and crafters. Simple meals like spaghetti, bread, and salad, followed by piles of homemade cookies, are served family-style in the 300-seat dining room. The adjacent “pink parlor” and “writing room” are reserved for quiet activities. “You’re stepping into something the way it was, and you can’t really do that in other places,” says Joe Watts, an ever-smiling presence and the CEO of the nonprofit Star Island Corporation that has owned and managed the 46-acre island, named by sailors for its roughly five-pointed shape, since 1916. There are no cars, TVs, or piped-in music, although guests do bring and play their own instruments. WiFi and cell-phone coverage is available, but spotty; many people leave their electronics at home, and often find they’re relieved to be rid of them. “This place is about old-school interaction with other people, and with a place, with nature, and history,” Watts adds. “You can’t help but do that when you’re here.” The winds blow through his office windows, coupled with sounds of waves slapping or crashing against rocks, and seagulls calling. The contemporary world dissolves, often literally, into the fog. Nearly everyone also participates in one of more than 60 programs, or what the organization calls “conferences,” offered from June through September. (Registration opened on January 1, and sessions fill up quickly.) Topics range from art and culture, physical wellness, and regional history to ecology and climate change, and religion and spirituality, along with hugely popular family and young adult conferences; most last a few days or a week. It sounds corny, Watts admits, but “the hope is that people will come here and learn something, and bring it forward to make the world a better place.” That vision is rooted in the values of the Unitarian Universalist Association and the United Church of Christ, which guide the Star Island Corporation, although anyone, “regardless of their spiritual persuasion,” Watts assures, is welcome. The churches have held summer religious “conferences” on Star since 1897, and bought the island after the bank foreclosed on previous owners. The corporation soon also acquired adjacent Appledore Island, which, at 95 acres, is the largest of the Isles of Shoals. Appledore has its own legacy. It was home to nineteenth-century poet and gardener Celia Laighton Thaxter, who helped run her family’s summer resort there in the latter half of the 1800s and was instrumental in developing a summer arts community that lured Childe Hassam, Nathaniel Hawthorne, and Sarah Orne Jewett. Harvard’s first music professor, John Knowles Paine, was also a close friend, according to unofficial Isles historian (not the novelist) Ann Beattie: he even shipped a piano to Thaxter’s parlor so he and fellow musicians could compose and play. These days, there are a few private homes and the seasonal Shoals Marine Lab, a partnership between Cornell and University of New Hampshire. It keeps roughly a hundred people busy between May and October; some of them run educational programs and tours, including a visit to the recreation of Thaxter’s flower garden, during July and August. Star and Appledore are, typically, the only islands in the Shoals cluster routinely open to the public. There are three other islands to the south: White, home of White Lighthouse (first established in 1821), and Seavey (both state properties), and the privately owned Lunging. Four more lie to the north, in Maine waters: Smuttynose (the third largest, and site of the notorious 1873 murder of two women that has inspired many books and a movie), diminutive Malaga, and Cedar are all in private hands, but Duck is a state-owned nature preserve, home to seals, terns, and other wildlife, and off limits to humans. Ferryboat and chartered cruises offer narrated tours around the islands; an estimated 15,000 day-trippers visit the Isles each year, stopping mostly at Star to eat, walk, learn about its sustainability program, or browse in the Oceanic Hotel’s book shop. Long before the tourists began arriving, Native Americans were on the Shoals, probably fishing and hunting birds and seals; archaeological excavations suggest a landfall between a.d. 800 and 1200. The first European to both spot and map the Shoals was English explorer Captain John Smith; he never set foot on them, but by 1661 Appledore had an incorporated township, followed by Gosport village on Star. The first elaborate Shoals hotel was built by entrepreneur Thomas Laighton (Celia’s father, and a former White Lighthouse keeper), who bought up most of Appledore Island, and developed the Appledore House resort in 1848. Boston businessman John Poor, of the Stickney & Poor Mustard Emporium, followed suit, building the original Oceanic Hotel on Star in 1873. Fire destroyed it within three seasons, but Poor—known for his resourcefulness, Beattie says—soon “cobbled together” the current Oceanic House from two existing boarding houses, “the home of a former Shoaler, and some leftover lumber.” It opened for 300 guests in 1876, with bedrooms eventually “outfitted with electric bells and gas lighting supplied from an on-island coal conversion plant,” as well as indoor plumbing. Star Island was once a fishing hub. By that time, Celia Thaxter was spending a good part of the year on Appledore, helping with her family’s hotel, and living in her own island home, hosting “what are believed to be the first American salons,” says Beattie. Poet, politician, and abolitionist John Greenleaf Whittier was a good friend who visited often, as was Childe Hassam, who illustrated her poetic, diaristic An Island Garden and had a studio there. Painter William Morris Hunt completed his last works on the island, then drowned there in an apparent suicide. (Thaxter found his body.) That era drew to a close soon after her own death in 1894 on Appledore, where a stone marks her grave. Star’s landscape, too, is layered with history. On the north side is the state’s tallest gravestone: the 46.5-foot granite obelisk towers over the remains of beloved minister, physician, educator, and magistrate John Tucke, A.B. 1723. Ordained on Star in 1732, he served parishioners for more than 40 years before dying there in 1773. Just beyond the Gosport Chapel, built at Star’s highest elevation, is the Vaughn-Thaxter Cottage. Now used as a library and museum, it offers records from Gosport village, vintage maps and photographs, Oceanic House relics, and books by and about Thaxter, including An Island Garden. On that more recent chilly morning just before dawn, standing at what felt like the edge of the world, it seemed that little had changed.